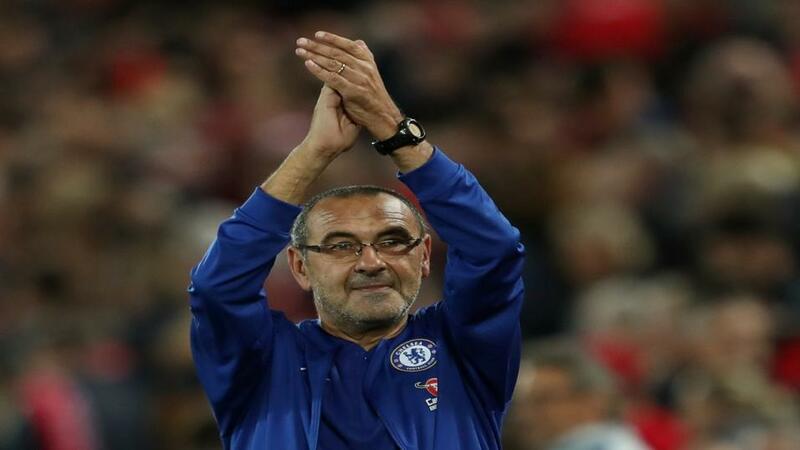 Will Maurizio Sarri be applauding his Chelsea team after their match with Everton? Will Chelsea keep pace at the top of the Premier League with a victory over Everton? Opta reveals all. "Everton manager Marco Silva has lost all six of his away Premier League matches in London – no manager has a worse 100% losing rate in London than Silva." A Chelsea win and both teams to score is [2.88]. Chelsea are unbeaten in 23 home Premier League games against Everton (W13 D10) since losing 0-1 in November 1994. They are [1.44] to win. In all competitions, Everton have won none of their last 28 visits to Stamford Bridge against Chelsea (D11 L17). The draw is [5.1]. Only one team has ever had a longer winless away run against an opponent in Premier League history than Everton's current 23 against Chelsea - Spurs went 25 away games without a win at Stamford Bridge between 1993 and 2016. Chelsea are [2.1] to win half-time/full-time. Everton have won one of their last 16 away Premier League games in London (D6 L9), losing their last four in a row, all during 2018. The draw half-time/Chelsea full-time double result is [4.6]. Chelsea are looking to remain unbeaten in their opening 12 games to a top-flight season for only the second time, also doing so in 2014-15 (unbeaten in first 14). They are [2.62] to win to nil. Chelsea midfielder Cesc Fàbregas has had a hand in 10 goals in his last 10 Premier League games against Everton (5 goals, 5 assists). Fabregas is [7.0] to score. If Chelsea avoid defeat here, Maurizio Sarri will set a new record for longest unbeaten start in the competition by a manager (12 games), overtaking Frank Clark's 11 games in 1994. Chelsea are [3.35] to win both halves. Coming into this matchday, no player has been involved in more Premier League goals this season than Chelsea's Eden Hazard (11 - 7 goals, 4 assists). Hazard is [2.0] to find the net. Everton manager Marco Silva has lost all six of his away Premier League matches in London - no manager has a worse 100% losing rate in London than Silva, with Nigel Pearson also losing six out of six in the capital; only one manager has lost his first seven Premier League away games in London (Mick McCarthy, who lost his first eight). A Chelsea win and both teams to score is [2.88].